We grow our own Chia seed. Yes, it’s that wonder food that is all the rage at the moment. High in Omega 3 fatty acids, lots of fibre, calcium, manganese, phosphorous and 4.4 grams protein per 28gram seed-Almost as much protein as an egg. Not only is it intriguing to harvest your own, it’s a pretty plant in any garden. Who are its relatives? 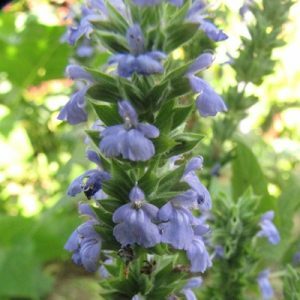 Its botanical name is Salvia hispanica. This makes it a relative to the sages we grow in the garden for both culinary and floral effect and a more distant relative of mint as it’s in the Labiaceae family. When to grow it and what sort of space does it need? 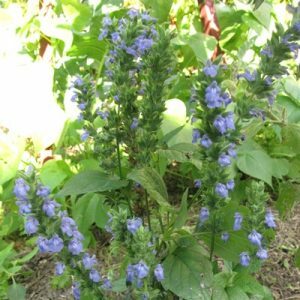 I grow seed of chia over winter and very early spring here in the subtropics. It’s a short day plant, flowering in the seasons with short day length. However, it doesn’t appreciate a frost and will die on you if your garden gets frost or snow. This season I allowed 2 rows 30 cm apart, each about 2.2 metres long. Seeds were finely sprinkled along the row. I will harvest about 100 grams from this amount of plants. Not much for the work of growing and separating the seeds. How long til harvest? The seed I grew at the Botanic Garden in Brisbane when I grew the vegetable patch for many years, used to grow to at least 1.6 metres tall. In my new Capalaba garden this season it has achieved about 1 metre in height. Even though it was quite short, I still put a stake at each corner of the bed and tied string around and between the stakes as a support for the rangy plants. It will take about 4 months from sowing seeds to harvest. Separating the seed Once the plant has produced its pretty lavender blue spike of flowers it will dry off, beginning with the flower stalks. Chop these mature heads off as the begin to brown. Save them in a paper bag and dry them out well. A few weeks later, scrunch up the neck of the paper bag and shake it around. The seeds will fall out of their seed heads and into the paper bag. They can then be separated from the chaff by a winnowing on a tray. Store the seed in a cool, dry dark spot. Blend them all up in a blender. Pour into small cups. Allow to stand 10 minutes. It will go quite solid as the chia absorbs the moisture and swell. Then you can eat it with a spoon.